Upright vacuum cleaners are frequently found in the US, Britain and several Commonwealth countries. They are not common in Continental Europe like cylinder vacuum cleaners. Fan bypass upright vacuum cleaners have their motor mounted after the bag and the filter. Dust is collected in the bag, additionally filtered by filter and then air passes through the fan – thus the name 'clean-air'. Electric motor that spins fan is cooled with airstream passing through it. 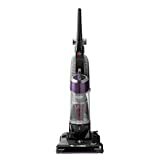 Since suction power is not significantly reduced over the distance of a hose, fan bypass upright vacuum cleaners are good for both above-floor and carpet cleaning. On the other hand, air flow is not very efficient and can require more power than direct-fan cleaners to achieve the same cleaning results – even twice more. 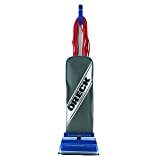 Direct fan upright vacuum cleaners have a large fan mounted close to the suction opening. Filth and dirt passes directly through the fan or impeller, before being moved into the bag – thus the name 'dirty-air'. Electric motor is often cooled by a separate cooling fan directly attached on the rotor shaft. Since their fans are optimized for airflow volume and not suction, direct fan upright vacuum cleaners are great carpet cleaners. Also, there are upright vacuum cleaners that are variations in construction from these two models. Or, there are upright vacuum cleaners that have additional features. Those for cleaning stairs, vertical surfaces, unreachable places (for classic upright vacuum cleaners) etc. These hoses can have same cleaning attachments just as cylinder vacuum cleaners have. Which upright vacuum cleaner to choose? 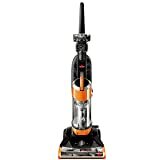 Which is the best upright vacuum cleaner depends on many things, mostly on personal preferences and needs, area that needs to be cleaned, surface type etc.